Lemurs are the stars of attraction Red Island. Undoubtedly, the most famous inhabitants of Big island are the lemurs. They can be found in National Parks, natural reserves; or in their simplest habitat, the rainforest. Malagasy fauna will give a little magic to your excursions during a forest hike, your outings in the Great South or birdwatching tours. Their preservation they are bound to the isolation of Madagascar from the rest of the world. You will see the lemur in its natural habitat only Madagascar. Tracking them is a thrilling adventure through a landscape of vast contrasts and changing climates. 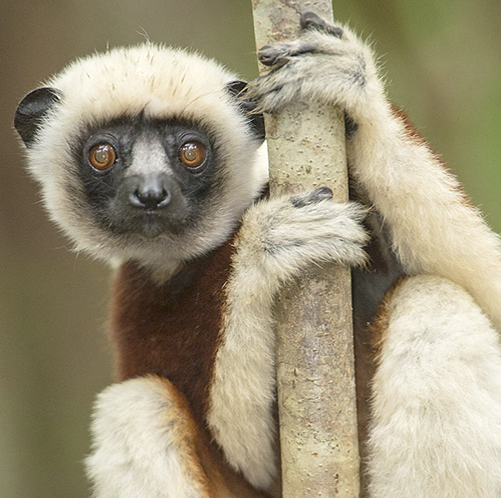 Lemurs are very smart animals, some species like the Sifaka; are very comfortable with humans. It is normal for a lemur to lodge on your shoulders during your outings in the forest. Lemurs feed mainly on leaves and fruit, some eat eggs of birds and reptiles, as well as insects. Some of them has nocturnal and crepuscular lifestyle, basically the lemur - is a daytime animal. Nowadays, there are 106 species and subspecies of lemurs many different colors, shapes and sizes. Each one can be found in Madagascar, the places where they can be observed are innumerable. New species are still discovered today, two new species have been discovered recently, eg the dwarf lemur of Ankarana and 15 species, unfortunately extinct. While you are on the island, you will have no trouble discovering lemurs in their natural habitat, particularly in National Parks since they are generally very noisy! We will take you to the most visited spots, depending on the species you want to see. Some types of lemurs are very sociable and not very fierce, and you will not have difficulty approaching them. However, don’t tease these animals to avoid scratches and bites. They are used to living in groups, and you will have more chances of meeting families (with their children), once it is night time. 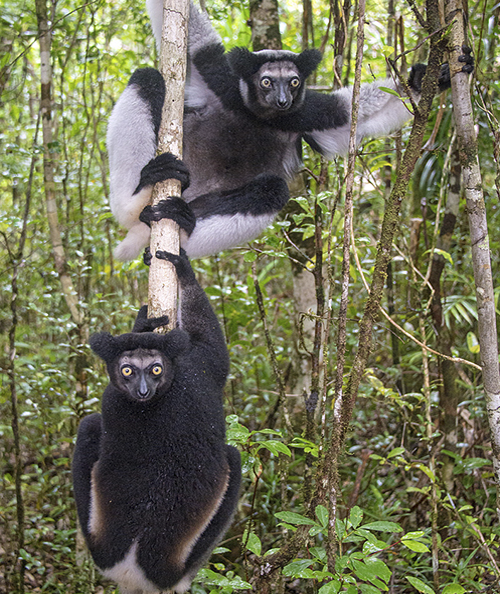 INDRI lemur – are the largest living species of lemur. The creature's Malagasy name is "babakoto," meaning "ancestor" or "father." 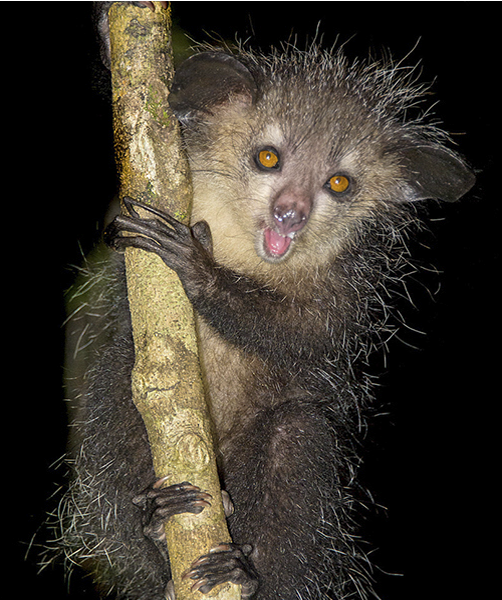 The AYE-AYE, the nocturnal lemur is very solitary and discreet, you will only see it at night. It’s one of the rarest nocturnal species. It is a very original lemur with its bat ears, squirrel tail and its one finger that is longer than the others. To discover it, you would have to venture into the Malagasy forest depths and discover the secrets that the island contains. 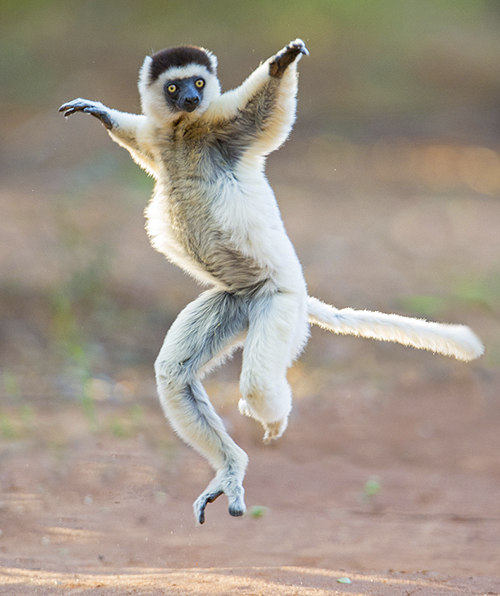 The SIFAKA, the dancing lemur has developed a particular means of locomotion, due to its habitat being in the trees. It moves on two legs by large lateral leaps. You will easily recognize it, thanks to its thick coat ranging from white to black and its tail longer than its body. They are comfortable with humans and might approach you to beg for a banana during your outings. The sifaka inhabit lush tropical rainforests, spiny dry forests, semi-arid desert canyons and cool central highlands. The famous MAKI CATTA recognizable by its black and white ring tail, is the most popular species of the lemur. It takes its name from its mewing and its purr, similar to the cat (from which it takes its name). Several places are suitable to observe, the most spectacular will be in the Isalo National Park, the Nahampoana Private Reserve, or in the Zombitse-Vohibasia National Park.